Your labels can be just as important as the brand, or product itself to gain and retain customers. A consumers purchasing intention, affiliation or loyalty is influenced by numerous factors, one of which is the product label. Which is also the marketing communication closest to the decision making process, or point of purchase. Therefore the quality of material, design, image, layout and finish are all critical factors in creating high quality labels that work for your business. Your labels are as important as your brand, product or organisational image, in communicating your chosen values. Because the medium becomes the message and the label quality you choose says a lot about you, but a poor quality label can say even more! We understand that the combination of label material, adhesive, design, print and finish are all critical elements in a labels appearance and performance. 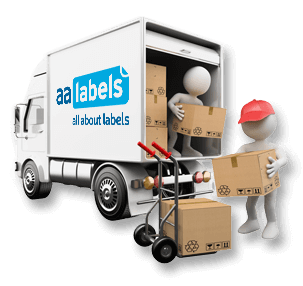 Delivering the highest quality standards in label production and customer care is a collective responsibility at AA Labels, ensuring that you receive a high quality label for your application. Start by using the filters to select the shape, size, material, colour and adhesive type of the label that you require. After selecting the label you can decide the format e.g. rolls or sheets, the number of labels and price. 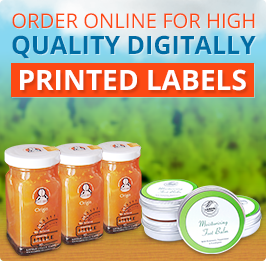 Finally upload the artwork and place your order to receive high quality digitally printed labels. In addition to regular, repeat volume label orders from large customer organisations, we also have many SME customers with a number of first-time orders being placed daily. Our customer care team are experienced and skilled in assisting start-up businesses to produce the labels required and are happy to provide advice on everything to do with labelling. 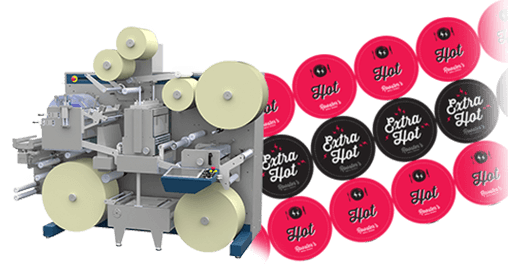 So if you are looking for a labelling specialist that values short-run label business, then you have come to the right place. Additional information about our printed label service is available by opening the tabs below. Upon placement of order and submission of artwork our studio designers will prepare a print ready file for label production. 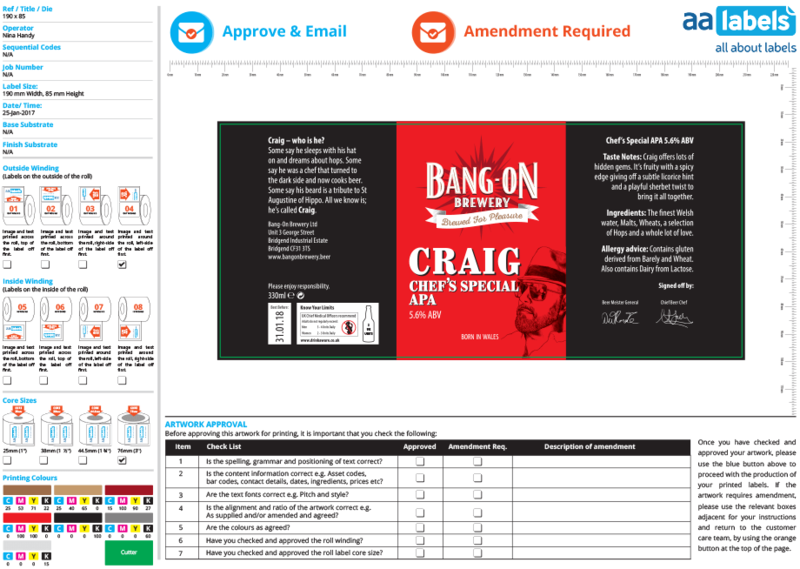 Prior to proceeding to print we will first send you an electronic soft-proof for approval, via email. If you also require an additional press-proof/s for approval, prior to production, then this can also be provided and our customer care team will be able to provide you with details of the cost of this service for your artworks. 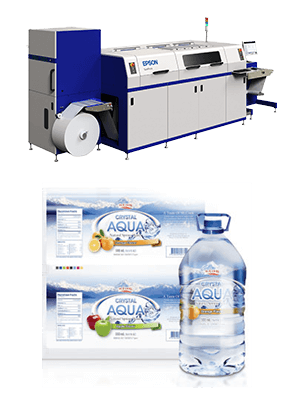 Our 7 colour inkjet digital label press, with white ink, delivers exceptional print quality and accurate colour reproduction on a variety of standard label substrates. Ideal for high quality short to medium–run label printing. Cyan, Magenta, Yellow, Black, Green, Orange & White. 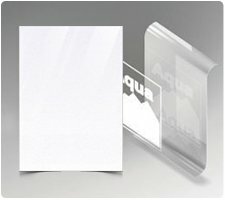 The inclusion of white ink for solid, opaque white printing on materials such as clear film and metallic substrates. 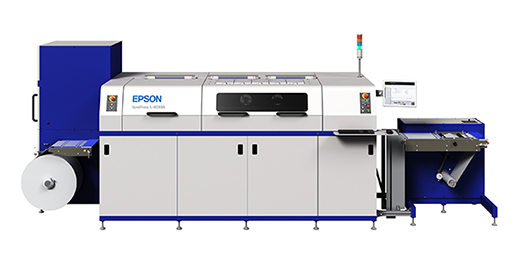 Facilitates the production of metallic colours and finishes, white text and panels on clear labels and the flexibility of printing white first or last e.g. window stickers. 80mm – 330.2mm adjustable to support any width within this range. Up to 315.2mm x 914.4mm maximum. Label Face-Stock/Substrate Matt, gloss and semi-gloss paper, Polyethylene & Polypropylene. Orders are added to the print queue following final approval of artwork from the soft-proof provided. We commit to print, finishing and conversion within 4 working days from this point. Despatch Deliveries are made the following working day in mainland UK (other than exception postcodes and offshore). Delivery times outside of the UK vary, please refer to "Delivery & Shipping" under "SITE LINKS" in the footer of this page. You can therefore expect to receive your printed labels within 3 – 5 working days in the UK. Outside of the UK delivery times vary. 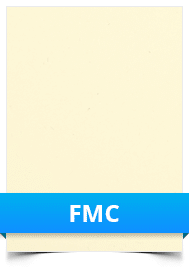 Samples of label materials can be provided (FOC) for evaluation of the application suitability , but will not be a label size sample. These can be ordered from the website, or by contacting customer care. In addition to soft-proof artwork for approval, should you require a physical print sample of your label to assess and approve the print quality, layout and finish. Please contact our customer care team who will be able to advise of the cost of this service for your order. Select the label shape and size required using the shape icons and size filters below. Sizes can be filtered using the sliders or by free typing in the boxes provided and you can also see size options with the dimensions switched by ticking the box beneath the size sliders. of Shapes and Sizes in Roll and Sheet Format for your Printed Labels. The label choices e.g. size, material, adhesive etc. selected could be available in both roll and sheet formats and if so both options will be displayed on the page here. Allowing you to select the most suitable for your application and budget. If the label is not available in both formats you will see only one or the other displayed, not both. Select the label material and finish required along with the adhesive type for your label application. Also the material colour, if not white and once selected choose the appropriate print type. If you would like advice on an appropriate material selection please contact our customer care team using the “Live Chat” facility on the page during office hours. The choice of material has aesthetic and practical considerations, because not only should the label look nice, but it must also be fit-for-purpose. Therefore the label face-stock material needs to be suitable for the application. For example a paper label would not be the best material choice for an industrial application that requires abrasion resistance and a thicker Polyethylene material would not be the best choice of material for a bottle label, but it would for an industrial oil drum. Therefore both application and life cycle requirement should be considered, in association with appearance. e.g. semi-gloss, gloss. high gloss, thermal etc. In addition to the above summary there are specialist face-stock materials for temperature resistant applications (cold and heat), security and water resistant applications. For more information please refer to the materials specifications page and/or speak with our customer care team. Label designs requiring a full colour bleed background will in most instances be printed onto a white label face-stock. However in label designs where the label background is intended to be seen e.g. wine bottle labels, the choice of colour becomes an important consideration. Label face-stocks are available in a range of standard colours to help create labels that work in design terms. For more information please refer to the materials specifications page and/or speak with our customer care team. Finishing Digitally Printed Labels: What Do You Really Need? In the world of label production, finishing or converting a label is as important as the accuracy and quality of the printing process itself. The decision whether to use inline or offline finishing/converting solutions depends on the make-up of incoming orders and the specific market needs of our customers. Today's labels are more than just pretty pictures. 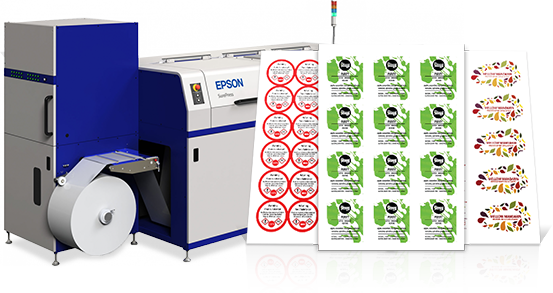 Digital production of labels requires many components, such as the printing press, toners/inks, laminates, varnishes, suitable substrates, appropriate software solutions as well as the right finishing equipment. The best label solutions include all these components in a well thought-out fashion. Self-adhesive or pressure-sensitive labels are transformed into final products only when finishing has been applied. It allows the product to remain visible despite the presence of laminate or varnish. The following table provides an effective overview of the use of labels in various sectors and indicates the type of print finishing normally required for a specific sector. While these details are based on surveys of conventional printing technologies, they apply to digital printing as well, with just a few exceptions. All of the above label finish options have been tested for thermal-transfer printer compatibility, however ribbon types and printer models can produce variable results. Therefore while this is a general guide of compatibility, it should not be considered definitive and testing is always advisable. If a label is likely to be exposed to more demanding conditions of use, laminates are preferred in the print finishing process. 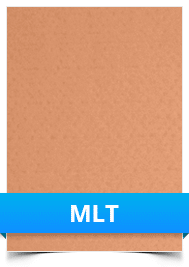 Laminates provide protection from mechanical abrasion, chemical solvents and oils and also include functional barriers, such as sunlight protection factors. 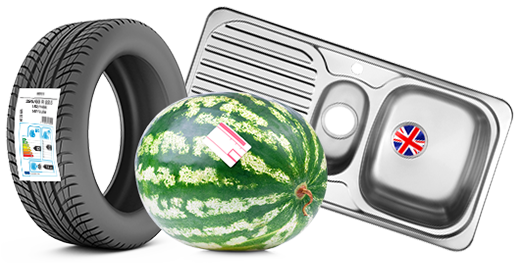 In these cases, a self-adhesive laminate or a film pre-treated with UV adhesive can also be applied directly to the label. Laminating also offers a long shelf life. Mainly UV liquid varnishes are used for both for protecting the product and for aesthetic reasons. 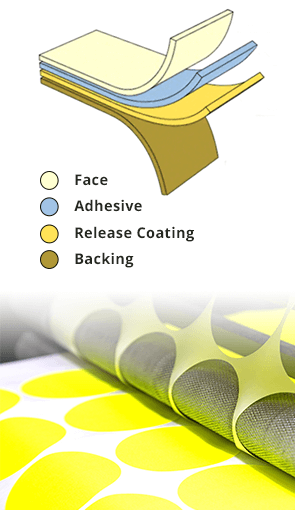 Anytime varnish is applied in the digital printing process – regardless of whether the system uses dry or liquid toner/inks – the primary function of the varnish is to provide adequate protection from wear and scratching. In inkjet printing, varnish is mainly used to enhance appearance, and to provide the printed product with a shiny finish of a uniform brightness. Pharmaceutical labels are normally finished with spot coatings and water-based varnishes. This means it is possible to add over-printing to the label later in the packaging production process. There are two basic types of label adhesive: permanent and removable. Each type can be made from a variety of materials and the choice is determined by the surface being labelled, the conditions the label will have to endure, the required longevity of the label and its purpose. 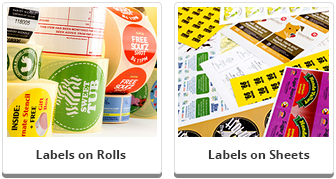 The most popular types of label adhesive are acrylic, rubber and water-based. If a label will be exposed to a very moist environment, such as a freezer, refrigerator or cooler, water-based adhesives are not practical. They break down, and the labels can fall off the products, regardless of the surface to which they are applied. Water-based adhesives therefore should only be used in dry environments. Adhesives mainly composed of rubber are preferred for their tackiness. They are prone to failure when exposed to UV rays over extended periods of time. If the labels will not be exposed to sunlight, this type of adhesive works fine. Acrylic-based bonding agents are easy to work with during application, as they can be easily moved around. Once acrylic glue dries, however, the bond is permanent. This type of label adhesive is suitable for long-lasting products that need labels to withstand time and frequent handling. All of the above adhesive categories have a range of adhesives available e.g. Frost Fix; Freezer and Cryogenic adhesives are designed for increasingly lower temperature applications. Before a label adhesive is chosen, many factors must be considered. These include the size of the label, the material and texture of the surface to be labelled and the mobility level required; some, such as retail labels for electronic products and white goods, are intended to be removed, while others, such as shipping labels, can be left intact indefinitely. If a label is attached with the intent of it never being removed, or if only a solvent would remove it, it is called permanent. In some cases, before a label attains permanent status, it has a short period where it can be moved. These labels are often referred to as repositionable. A peelable label is just that: it can be peeled off a surface. The surface exterior is not marred, and no adhesive residue is left behind. This type of label can normally be used two or three times and not lose its stickiness. 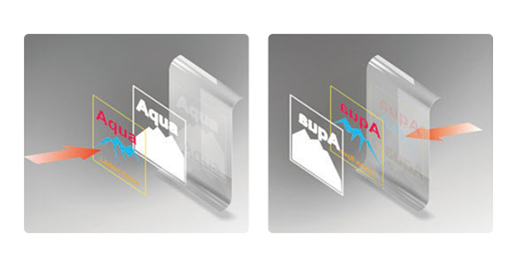 An ultra-peelable label is popularly used on book jackets and glass, where no residue is acceptable. These labels can only be used once before the adhesive is gone. The digital printing process is seamless in information transfer terms and the designs provided by customers in electronic file formats are assessed and checked before preparing press files for final approval, before printing. This takes the form of an electronic soft-proof sent to our customers via email which once approved is sent to the print queue for production. If you require a press-proof before proceeding to produce your label order this can be arranged and you should contact our customer care team to discuss your requirements. Printed roll labels are produced on a 7 colour digital inkjet press, producing exceptional image and print quality, along with accurate colour reproduction on a variety of standard label face-stock materials e.g. 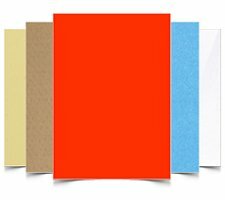 semi-gloss white paper, luxury papers, semi-gloss white Polypropylene, gloss clear Polypropylene and bright silver Polypropylene (metallic colours). Colours: Cyan, Magenta, Yellow, Black, Green, Orange & White The inclusion of white ink for solid opaque white printing on materials such as clear films and metallic substrates, facilitates the production of metallic colours and finishes, white text and panels on clear labels and the printing of window stickers. The digital printing process does not require metal plates to be manufactured for colour separations, as with offset litho, or solvents to clean machinery and plates, because the ink used is aqueous. Making digital inkjet printing the most environmentally considerate process by removing the use of chemicals and reducing the associated carbon footprint. Orders are added to the print-queue following final approval of artwork from the soft-proof (or press-proof if required) provided. We commit to print, label conversion and finishing within 4 working days from this point. Are made the following working day in mainland UK (other than post codes considered to be a 2 day service by courier companies and offshore locations). Delivery times outside of the UK vary, please refer to "Delivery & Shipping" under SITE LINKS in the footer of this page. You can therefore expect to receive your printed roll labels within 5 working days within the UK. Outside of the UK delivery times vary and our customer care team will advise you and provide details of your delivery tracking. The following brief guidelines are intended to assist in preparing digital artwork for submission to AA Labels. They are not intended to be exhaustive or infallible, but following the simple tips laid out below will help to minimise the risk of some common problems which can occur when printing from digital files. Printing digital images can be frustrating if you don't have an understanding of print quality versus screen quality. A screen quality image, which looks fine on your monitor will often look ragged or pixellated when you print it. This section explains how to ensure you get the best possible print result from your digital images, regardless of what computer program you are using to create your artwork. Digital images come in two main types: Vector & Raster Images. Vector Images are usually logos or line art graphics which can be enlarged or reduced in size without affecting the quality of the printed result. Most commonly used images, however, including digital photographs (Jpeg being the most common file format), are raster images, which means that they are made up of a finite number of dots or pixels. The quality of this type of image when printed, varies depending on the image and label size. For example, you might have a picture file which is 500 pixels by 250 pixels in size – and this will not change, no matter how much you enlarge or reduce the size of the picture on the page. So if you make the picture 2 inches wide by 1 inch high, it's resolution will be 250 dots per inch (dpi). As a general "rule of thumb" this is the maximum size you can make this particular picture, without starting to compromise its quality when it is printed. If you enlarge the picture to 4 inches wide by 2 inches high, its resolution will drop to 125 dpi, because you've got the same number of pixels spread over a greater area. This will impair the output quality when you print it. For the purposes of printed label applications, all your graphics should be a minimum of 200 dpi to print cleanly. For large format printing (e.g. A4 or A3 size labels) 300 dpi is usually preferable, depending on the image. Web graphics and "screen-grabs" are usually only 72 dpi, which is screen quality and looks fine on a monitor, but the results are not as good when printed. 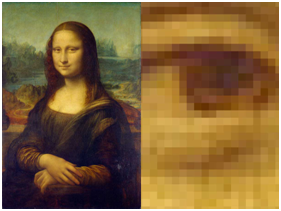 Above is a digital image of the Mona Lisa and on the right is an enlargement of the eye. A beautiful raster image made up of millions of tiny coloured squares, becomes pixellated when enlarged. It won't help you much to use software like Adobe Photoshop to increase the resolution of a web graphic from 72 dpi to 250 dpi – you can't improve upon the quality you had in the first place – you need to ensure that your graphics are set up at the correct resolution from the start. A table showing examples of minimum raster image sizes for publication and poster quality on standard paper sizes is shown below to provide a scale for use with the label sizes being considered. Most label applications are normally considerably smaller than this, but it is useful as a guideline. Raster image sizes for label or publication print quality. 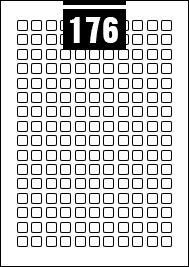 Approximate minimum dimensions, in pixels, for raster images to print at Label or publication quality at standard A paper sizes. 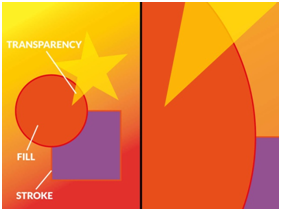 A vector object (stroke or fill) can be given a degree of transparency from completely opaque to completely transparent. 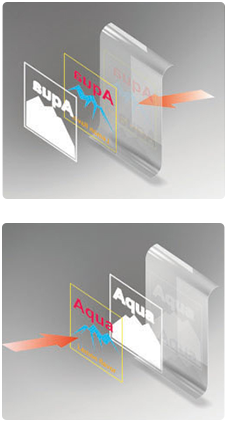 On the left is a vector illustration showing fills, strokes and transparency. On the right is an image zoomed into the centre, without any pixellation. Typical uses of Raster and Vector files. Adobe Illustrator native file format. 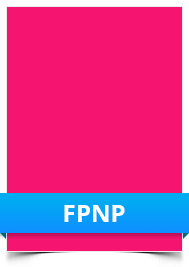 Adobe Photoshop native file format. This may seem obvious, but make sure your document is set up at a standard UK page size before you begin. This is usually a standard 'A' size like A4 or A3. Depending on your application preferences, Word documents can default to US letter size which can cause problems when the document is printed on A4 label sheets. PowerPoint's default page size is screen size because it is designed to be used for on-screen presentations, so if you are setting up a document for printing using PowerPoint you will need to also change this to the sheet label page size that you want printed e.g. A4/A3. This is particularly important for long documents, ingredients labels or large informational labels set up in Word which continuously reformats documents automatically, which can cause text to reflow from one section of text to another, particularly if you transport the file between different computers or different versions of Word. This can result in problems like the sections reformatting. It is always sensible to stick to standard fonts like Arial, Calibri, Bradley Hand, Times New Roman and other popular fonts, as these are installed on virtually every PC – so whichever PC you open your file on, the fonts will always appear the way you are expecting. PCs can only display and print fonts which are installed on their hard drive, so if you use a special or unusual font, and we don't have it installed on our computers, we will advise you of the cost of acquiring that font. Otherwise we will not be able to replicate it correctly. However our studio library of fonts is reasonably comprehensive, but new fonts are regularly being created. It is highly advisable to avoid using any graphics, logos or clipart images which you have downloaded from the internet, or photos saved from a web page, unless you are certain that they are sufficiently high-resolution to print cleanly. Screen-grabs or pictures, cut and pasted direct from web pages look fine on screen, but will look very poor when printed and should be avoided wherever possible. This is particularly important if you are increasing the size significantly. The more you enlarge a graphic, the worse it's going to look when it's printed. For more detailed guidance on using digital images, refer back to the previous section Printing Digital Images. PDF (Portable Document Format) and other graphics file formats. Choose the right quality setting. Most PDF writers will give you some kind of choice as to what level of quality you want your PDF to be. 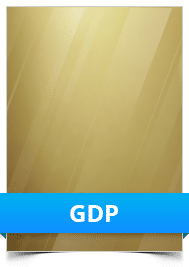 This will either be in the form of a description (e.g. "low quality", "standard", "press quality"), or output resolution (e.g. 72 dpi, 300 dpi, 1200 dpi), or both. As a rule of thumb, it is usually best to choose the highest available quality setting, as it's safest to make your PDF better quality than you need. Look for "print quality", "press quality" or "high quality" and 300 dpi resolution or more. "Low quality" or "screen quality" or resolution between 72 dpi and 150 dpi will not usually yield good results and should therefore be avoided. Even if you've selected "press quality" and 1200dpi, if the document you're printing contains low resolution graphics (e.g. screen-grabs or web graphics), the resulting PDF will not necessarily be print quality – converting to PDF won't improve the quality of the graphics you've used in the first place! Always embed your fonts As with Microsoft Office, if our PC doesn't have the fonts you have used in your document installed on it, it will substitute them for something else – which can have unexpected and unwanted results. However, you can choose to embed all the fonts you have used in your PDF when you create it. If you do this, it won't matter whether we have the fonts you have used or not – the PDF will contain enough information to make sure that your fonts print out correctly. Sub-heading and new paragraph. Many programs allow you to export your document as a graphics file, which, like PDF, will allow you to embed all the fonts and graphics in a single file. There are many different graphics file formats, the most common being JPEG (.jpg), TIFF (.tif) and EPS (.eps). However, saving your document in these formats should be approached with caution. A lot of programs (the Microsoft Office suite, for example) will allow you to save your documents as Jpegs or Tiffs very easily, but do not give you much control as to the image quality of the resulting graphics file. 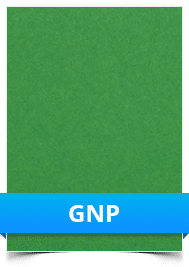 In most cases, the resolution of the graphics file will default to 72 dpi – which is low quality, suitable for screen viewing but not for printing. This is a particular issue in PowerPoint and can cause big problems when PowerPoint is used to create artwork, particularly for posters. Another difficulty with turning your documents into graphics files is that the resulting files tend to be massive (in terms of memory) and very difficult to handle – they might be too large to send by email, for example. Because of this we do not recommend that graphics file formats other than PDF are used, except in conjunction with DTP software as appropriate. DTP (desk-top publishing) software is specifically designed to prepare documents with a view to having them printed on press. They work alongside a family of graphics and imaging programs, e.g. Photoshop and Illustrator . 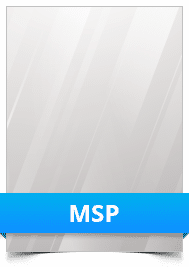 The graphics programs allow you to create and manipulate graphics files, and the DTP software allows you to organise these graphics onto the page along with your text. DTP programs can be tricky to use until you've had a bit of practice, and in order to use them correctly, some basic knowledge of printing processes is required. For the purposes of this document it is assumed that if you are using this kind of program, you will already have this knowledge and be familiar with use of DTP software. However, the following tips will help ensure that the files you submit are print-ready. 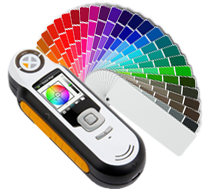 The Pantone Matching System is a universally accepted system which allows you to specify the exact colour ink you want to use, based on a pre-defined colour scale. If you're using Pantone colours, you can't use CMYK graphics alongside them, unless you're intending to print your document in full colour with additional Pantone colours on top – which will increase the cost of your print job. To print only in Pantone colours, you need to make sure that your graphics are suitably set up. The usual way of doing this is to convert them to greyscale (i.e. to discard the colour information and save them as black and white) and then to allocate them the Pantone colour you are using from within your DTP program. 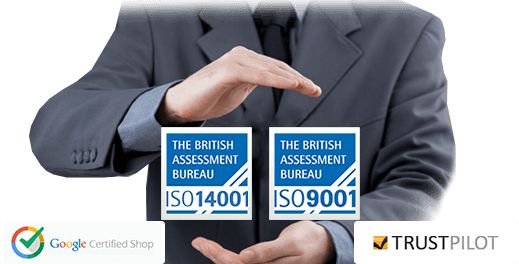 Image quality is explained in detail in the Printing Digital Images section of this document – but worth a reminder here. For publication print quality any raster images you are using must be a minimum of 250 dpi at the size they are to be printed. An image which is 250 dpi at A6 (postcard) size will effectively drop to 125 dpi if you decide to fill an A4 page with it, so make sure the images you are using are of suitable quality for the size you want to print them. The white rectangle denotes the roll or sheet onto which the label is printed. The red line shows the edge of the label (cutter line) NB: This should not appear on the artwork). The blue line shows the area which is printed, allowing for bleeds on all sides (min 2-3mm overlap). The marks at each corner are crop-marks, showing the printer where to cut. If using label sheets, please always check the label template selected to ensure that it is suitable for printing the artwork produced e.g. sufficient gap between and around labels to facilitate edge bleed if required and not outside of the printable area on sheets (c. 5mm "gutter" around the edge of the page on A4). Example (A) shows the correct use and amount of "bleed". Example (B) shows incorrect use and amount of "bleed". The range of hues that can be produced by a given colour space is known as its colour gamut. The gamut of RGB varies from that of CMYK. This can cause issues if you submit RGB artwork to a printer. Your RGB file will have to be converted to CMYK prior to printing. If your image includes colours that exist in the RGB colour gamut but not in the CMYK colour gamut then those colours will be shifted by the conversion software to a nearby colour that is. The new colour may not be what you expect… We most commonly see this with customers who have RGB images with very bright vibrant colours. These almost luminous colours look fantastic when viewed on a screen (which is light emitting remember) but are impossible to reproduce in print (which is light absorbing). Set your artwork up in CMYK in advance! If you are working with artwork that is RGB, convert it to CMYK yourself before sending it to us, so you are prepared for how the image will finally look when printed. 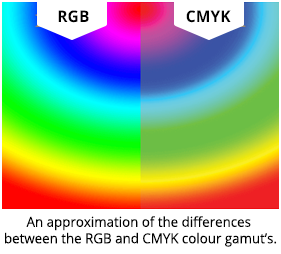 A comparison of the colour gamut between RGB and CMYK is shown above. You previously viewed the labels shown, would you like to reopen this search, or start a new one?